Oil on canvas. Inscribed and dated verso: Study for Head of Lucian Freud 1967. PROVENANCE: Marlborough Fine Art, Ltd. London 1967; there acquired by Roald Dahl, Gypsy House, Great Missenden, Buckinghamshire; thence by descent. LITERATURE: France Borel and Milan Kundera, Bacon. Portraits and Self-Portraits, 1996, p.213, illustrated in colour p.86; Christophe Domino, Francis Bacon, ‘Taking Reality by Surprise’, London 1997, p.133 (illustrated in colour); C. Debray (ed.) Lucian Freud: L’Atelier, exhib. cat., Paris, Centre George Pompidou, Musée national d’art modern, 2010, illustrated in colour p.41. EXHIBITED: London, Marlborough Fine Art Ltd., Francis Bacon: Recent Paintings, 1967; Paris, Centre Georges Pompidou, Musée national d’art modern and Munich, Haus der Kunst, Francis Bacon, 1996, cat.51, illustrated in colour p.166; Edinburgh, Scottish National Gallery and Hamburg, Hamburger Kunsthalle, Francis Bacon. Portraits and Heads, 2005-6, cat.47 (cat.38 in Hamburg catalogue), illustrated in colour; London, Tate Britain, 2009-2014, on extended loan. Francis Bacon and Lucian Freud first came to know one another in the mid 1940s. Initially it was a lopsided friendship with Bacon already confident of his art and Freud in the position of an admiring satellite. Bacon’s flamboyant, passionate style of painting inspired Freud to abandon his drawing instruments and take to oils. Though they quickly formed an intense friendship, meeting almost daily to drink, gamble and gossip in Soho, two such forceful characters, sharing the same profession, were inevitably caught up in a maelstrom of rivalry which they fed through mutual examination, each one painting a series of portraits of the other. In 1951, Bacon painted a large-scale monochromatic canvas of Freud standing, almost staggering, through a dark background with his soon to be recognisable framing lines or doorways1. Freud answered with a hyper-detailed, oil on copper of Bacon’s head, extracted from a long series of face-to-face sittings2. 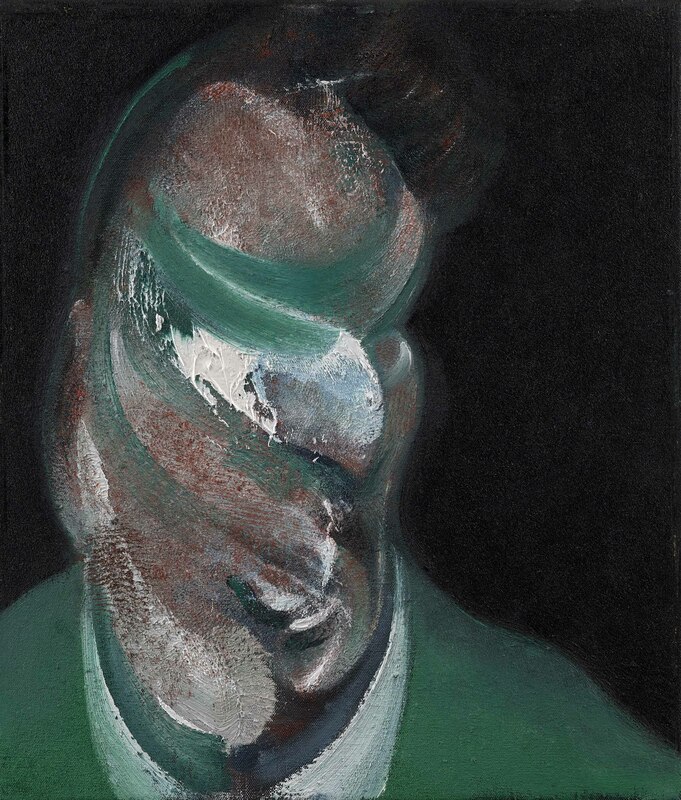 By the time this small but explosive canvas was painted, Francis Bacon was at the height of his powers with his critical success accelerating fast while Freud had become a master of a form of painterly, transgressively observational portraiture. In 1961 Francis Bacon moved to Reece Mews in South Kensington, which remained his base and studio for the rest of his life. In 1962, the Tate opened a major retrospective of his work which went on tour to Mannheim, Turin, Zurich and Amsterdam. The following year the Solomon R. Guggenheim Museum held a second retrospective and in 1971, a third, the largest, was opened at the Grand Palais in Paris. The profound effect create by the picture is partly bought on by the somehow shocking mixture of colours: green, black and white and the flesh tones of red and pink. The head seems to emerge from its velvet black ground as if circling out of a void. The repeated curves, which form the structure of the brow, the cheekbones, the collar, create a momentum and this movement is so vivid in the brushstrokes and all the varied applications of paint that the actions of the painter seem still to be reverberating. 1. Now in the Whitworth Art Gallery, Manchester. 2. Formerly in the collection of the Tate, until stolen in Berlin whilst there on exhibition in 1988. 3. Francis Bacon in conversation with David Sylvester (see David Sylvester, Interviews with Francis Bacon 1962-1979, London and New York, 1975, pp.40-41. 4. John Russell, Francis Bacon, London 1993, p.99. 5. See D. Sturrock, Storyteller: The Life of Roald Dahl, London 2011, p.440. 6. See interview with Luke Kelly in the New Yorker, Nicholas Niarchos, 27 June 2014.